If you look closely at the London Underground station walls, you can see quite a few posters from other Hammer projects such as The Reptile (1966), Dracula: Prince of Darkness (1966) and The Witches (1966). All Hell breaks loose, quite literally, when a strange craft is found in the newly excavated Hobbs End tube station. What lies within? Furrow-browed Professor Quatermass sticks his nose in and uncovers spooky not-so-little dead insects that just might have come from Mars might not be dead at all! 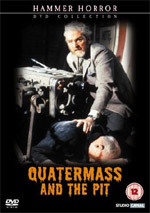 Considered by many critics to be the finest of the Quatermass movies Quatermass and the Pit is the third big screen outing of the popular character Professor Bernard Quatermass, created by the late British writer Nigel Kneale. Preceded by the very popular The Quatermass Experiment (a.k.a. The Creeping Unknown) (1955) and Quatermass 2 (a.k.a Enemy from Space) (1957), Quatermass and the Pit is based upon the 1958 TV serial of the same name and adapted by Kneale from his own material. Andrew Keir steps into the role played by Brian Donlevy from the last two outings, and makes for a solid if unspectacular lead as Professor Quatermass, his constant frown a source of some amusement. Would it really hurt him to smile just a little? Quite what Quatermass bases much of his findings on is as random as the next line that falls from comedian Russell Brand’s gob but somehow the momentum and writing of the piece convinces you to be suckered into his quite frankly preposterous ideas. More bewilderingly though Quatermass always ends up being right! Who would have thought it? Quatermass and the Pit is the sort of movie where men of science dig around in dirt / clay walls and never think that perhaps a nice suit is not the ideal clothing for such a task. It doesn’t seem to matter though as no one ever gets dirty down in the pit except for the odd bit of dirt being wiped from their hands. Barbara Shelley’s character Barbara Judd wanders around in the Pit in a bright red jumper with spruced up hair and even she manages to wander out mud free and that’s after psychic energy has thrown most of the Pit around in the air and at her. Director Roy Ward Baker, whose other big screen outings included the curiosity The Monster Club (1980) and the frankly bizarre The Legend of the 7 Golden Vampires, maintains a sense of ‘what will happen next’ throughout and the structure keeps you guessing as to whether there is actually something haunting the ‘pit’, something alien or in fact the Devil himself lurking down in Hobb’s End tube station! Ground-breaking for its time but rather neutered now with having so many other’s cribbing from Kneale’s material (The X-Files this means you!) Quatermass and the Pit makes for a pleasant Sunday afternoon’s viewing with the odd creepy moment balanced out by an unintentional laugh. Most of the effects work has held up well over the years and the sound effects are equally impressive adding to the required eerie effect. However the actual alien insects themselves leave a lot to be desired and the footage of them stomping around back on Mars destroying each other will have your jaw agog at the sheer awfulness of it. It’s a credit to the actors present during that scene that they did not give in to a little smirk as to what they were just witness to. I was too numb to move. In fact I had to replay the scene just to make sure I had not just imagined it. The DVD version reviewed was taken from the Ultimate Hammer Collection Box Set. See our earlier news story for full details of the 21 films included in the set.